This Colonial Lingerie Chest makes the perfect choice for your traditional bedroom furniture. 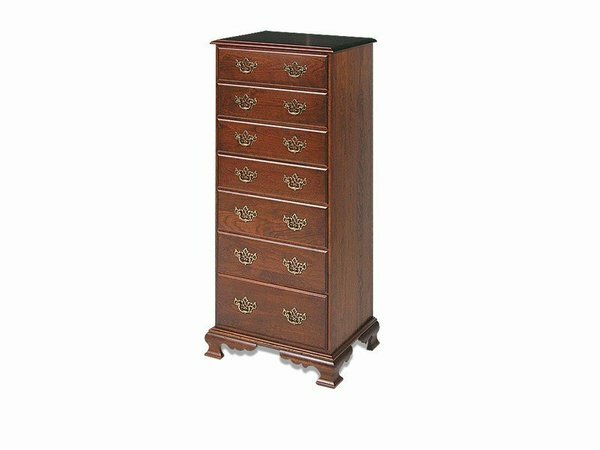 Store your delicate items in this beautiful chest of drawers that is Amish handcrafted from your choice of solid oak or cherry wood. Choose between a variety of hardward options including our popular Chippendale or brass bail. The drawers are dovetailed for years of everyday use and have your choice of wood slides, full extension slides and our ultimate option soft closing slides. If you are looking for another wood besides oak or cherry then please call one of our Amish furniture specialists. They will be happy to work up a quote for you. Our Colonial furniture is often customized in tiger maple wood.